A delightful holiday trip back to Whistle Stop, New Mexico! Jennifer Faye weaves a bit of magic every time we step into her next small town spiel. The characters are well developed, the plot is attention grabbing, and there is humor mixed in with angst as we watch this woman try to heal this broken man so his daughter can start to truly have her father whole again. Great story! Rancher Christian Danser likes organization in his life, and he’s convinced that nothing in his life or his house should change from the way his late wife left it. 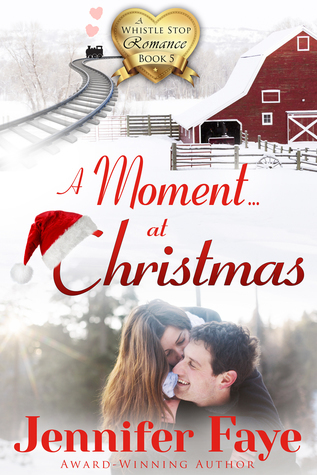 When he finds himself in need of a nanny for his little girl right before Christmas, he tries to resist hiring the best option that comes to the door even though his daughter seems to have taken a shine to her right off the bat. He can’t possibly hire such a young, attractive woman to live in his house … can he? Noelle Forrester unexpectedly loses her job and is on the hunt for something immediately to make sure she and her son aren’t living out on the street. When she answers an ad for a nanny, it brings her face to face with the cowboy who contributed in her losing her job! She doesn’t want to work for this guy ,… but how can she turn that little girl who seems to have her heart set on it down?